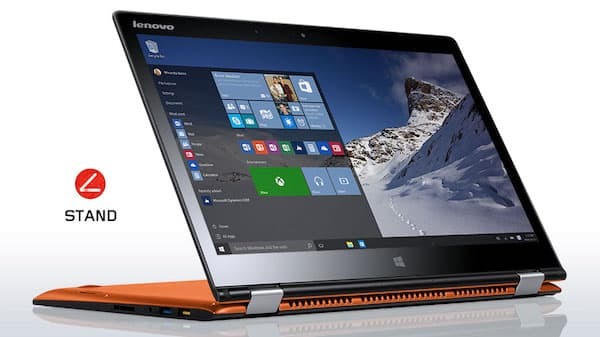 Lenovo has announced the launch of its two premium Windows 10 convertible laptops called the new YOGA 700 which are available in sizes: 11 and 14 inch. These laptops can be used in 4 different ways aka tablet, laptop, tent and stand as do all its brothers in the Lenovo YOGA series. The launch has happened in the US and the company hasn't yet revealed details about its availability in India or other Asian countries. While the 11 inch Yoga 700 is priced at $649 (~ Rs. 42000), the 14 inch variant is priced at $799 (~ Rs. 52000). Let's check out the laptop convertible's tech specs. Both Lenovo 700 variants - 11 and 14 inch feature FHD (1920 x 1080) resolution IPS displas with 10 point multi-touch responsive touch screens. Powered by Intel Core i7 processors (6th gen), the new series packs 8 GB DDR3L RAM and an optional NVIDIA GeForce 940M graphics card. The laptop comes with a DS1.0 Dolby Home Theatre stereo speakers. Featuring an effectively designed AccuType backlit keyboard, the Yoga 700 series tablet comes with a 7 hour battery life battery. Both laptop variants have their own USPs - For instance, the Lenovo Yoga 700 11-inch is pretty thin at 15.8 mm and it weigh just 1.1 kg making it suitable for carrying around in your backpack. Compare that to the 14-inch variant which has a 256 GB SSD storage making it deal for all your on-the-go storage needs. The laptop comes with a Windows 10 Home Edition OS built-in. Connectors include - two USB 3.0 ports, one USB 2.0 port, a micro HDMI, a 4-in-1 card reader and an 3.5 mm audio combo jack. Connectivity is taken care of with WiFi and Bluetooth support. Among the bunch of preloaded software that the laptop brings with it - there's Lenovo's OneKey Recovery, Companion 3.0, Photo Master, SHAREit, REACHit and McAfee LiveSafe for user's security. With that we come to the end of the topmost highlights of the Lenovo 700 Series laptop's features. What are your thoughts about their arrival in India? Share with us in comments below.